The high-speed loop will connect Chicago O'Hare Airport to downtown. The Boring company will bid to build a transit link between O'Hare airport and downtown Chicago, CEO Elon Musk announced on Twitter. The project, unveiled on November 28th by Chicago Mayor Rahm Emanuel, aims to provide commuters with a 20-minute option to taxi or Uber rides, which cost between $40 and $60. The project could run under or below ground, and will be bankrolled "entirely by the concessionaire" and not taxpayers, the city said. "The Boring Company will compete to fund, build & operate a high-speed Loop connecting Chicago O'Hare Airport to downtown," said Musk in a tweet. Given Boring Company's tunneling expertise, that obviously means it's likely to propose an under-, rather than above-ground link. Chicago city officials recently took a trip to LA to meet with Musk and presumably discuss his ideas for high speed rail, the Chicago Sun-Times notes. The Boring Company has shown off futuristic plans for a high-speed "skate" that would carry cars from point-to-point (shown below), but hasn't discussed subway-style transportation much. When someone asked Musk if the high-speed loop meant a skate-type tunnel, he replied "kinda." The Chicago Transit Authority (CTA) already has trains that run between both Midway and O'Hare and downtown for $5, but the travel time is around 45 minutes. The high-speed option would take just 20 minutes and provide a direct trip from O'Hare to downtown. "There's a lot of room between the price of the CTA [and Ubers or taxis] to price a service in a way that you can make a lot of revenue," Deputy Mayor Bob Rivkin told the Sun-Times. Bidders must give a price that includes downtown and O'Hare stations along with a maintenance facility, and propose options that "minimize potential conflicts or impacts on existing transportation systems and the environment," the request-for-proposal documents state. 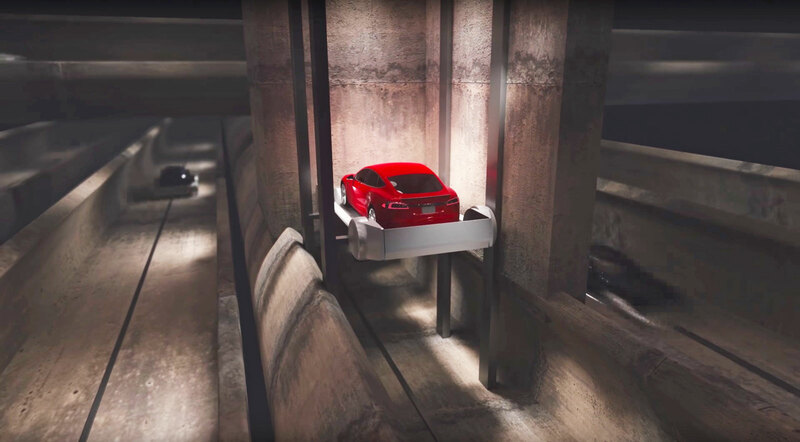 Building below ground generally costs more than overland solutions, but the Boring Company and its autonomous drilling machines would probably disrupt existing transit and traffic the least. Mayor Emanuel was reportedly very keen on Musk's technology, so it'll be interesting to see how the bid process plays out. Either way, Musk's involvement is bound to create more than the normal amount of interest in the project.